Poterack Vs. Tucker — Uh, Sort Of . . .
OOKING BACK at my college career, one of the most interesting classes I attended involved two professors standing in front of a class full of undergraduates and . . . arguing. That’s right: arguing! It turns out the professors were actually the best of friends (the students did not know this initially), and this method of teaching was incredibly effective. Not only did it convey subject matter, but it demonstrated how to actually have an argument. I think I’ve met a grand total of 5-6 people who actually understand how to conduct a true argument. Most people do not. But that’s another story . . . Anyone who’s ever been to a Colloquium knows that Kurt and Jeff are very close (personally) which makes the exchange that much more interesting. I’m not going to say who’s right or wrong. To do that, I’d have to see the original Latin Mass Magazine piece mentioned by Dr. Poterack. So why am I bringing all this stuff up? Though I am somewhat loath to criticize a fellow liturgical conservative, I must say that his criticism of the Adoremus Hymnal is off target. Put briefly, he seems to dislike it because it is not the Liber Usualis and not Tridentine. 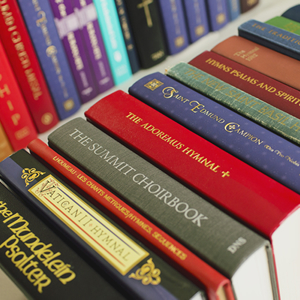 How many times has Watershed’s Vatican II Hymnal [url] been taken to task for the same reason! Just like Dr. Poterack says, so many people fail to understand what our book is. It is a book for the congregation, not a book for the choir. No matter how many times I try to get this point across, it never seems to “stick.” The Vatican II Hymnal was never meant to replace the Liber Usualis. The Sacred Congregation of Rites and the Consilium issued a joint statement on December 29,1966 prohibiting profane music in church. When Consilium spokesman Monsignor Annibale Bugnini was asked at a press conference what was meant by “profane” music, he said that this referred to such things as “jazz” Masses and instruments such as the guitar. That’s taken from a big article he wrote in the Winter 1998 edition of Sacred Music. I recommend reading this 1964 commentary by Msgr. McManus, because in it is revealed — less than a year after the Liturgy Constitution was passed — the quirky, ideological way in which the liturgy establishment intended to interpret article 36 of the constitution. Did you get that? In “some areas” (he means the United States, not Kenya) the “retention of Latin” will not mean the retention of Latin, and this total vernacularization will only in some cases use the original Latin as “the basis for translations.” What is particularly funny about the last sentence is that the Calvinist-leaning Archbishop Cranmer showed far more respect and sensitivity to the original Latin collects in the English translations he did for the 16th-century Anglican Book of Common Prayer than ICEL ended up showing in the 1970 Roman Catholic Sacramentary.